In a bowl, combine the tomatoes, garlic, thyme, oil, 1/4 teaspoon salt, and 1/4 teaspoon pepper. Scatter the tomato mixture around the meat and roast to the desired doneness, about 1 hour for medium-rare (internal temperature 125° F). 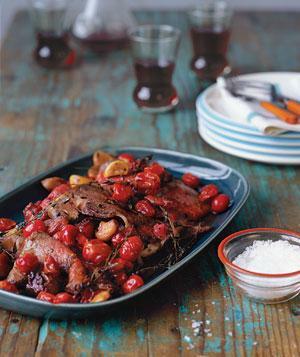 Thats your recipe for the week or maybe something that you can add into the menu for christmas or New Year!!! and just simply enjoy..